Like many other people around the world, I spent a sizeable portion of this weekend watching, with growing horror, the unimaginable scale of the disaster in Japan unfold before our eyes. There's no way to total up the cost of the thousands of dead and hundreds of thousands who survived but lost homes, businesses, loved ones. And yet, they don't call us the dismal scientists for nothing. People have been asking me if I could provide some perspective on the economic impacts of the disaster. So while there's no way to measure pain, anguish, death, and despair, I can share my thoughts about how this disaster is likely to affect certain statistics that are dutifully calculated and recorded by governments, and that a lot of people seem to care about, like GDP. Unsurprisingly, in the short run there will be a substantial negative impact on Japan's economy, both for physical as well as psychological reasons. The stock market in Japan plunged today, and Japan's central bank has stepped in to provide emergency liquidity to Japan's financial sector. Lots of businesses will be closed or severely disrupted for some time to come. For example, a substantial portion of Japan's auto production is likely to be shut down for at least the week. The electronics industry may be even more affected. 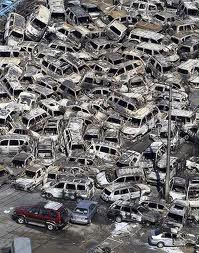 This lost production will show up directly and noticeably in Japan's GDP statistics for the first quarter of 2011. However, my guess is that supply and production disruptions will be substantially resolved by the end of March, and so there will be little impact on GDP in the second quarter of the year. After the earthquake in Kobe in 1995 it is estimated that lost production totaled at least $50 billion, according to a 10-year retrospective report (pdf) put out by Risk Management Solutions, Inc. in 2005. It wouldn't surprise me if it was higher than that this time, resulting in a loss of over 1% of Japan's GDP (which would mean an annualized contraction of 4% in Q1 2011). How much was lost? Here are two back-of-the-envelope calculations to help give us an estimate. 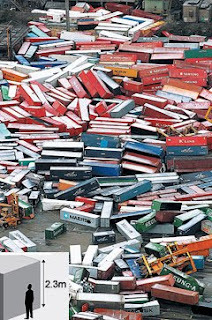 First, the RMS report on the 1995 Kobe earthquake estimated that infrastructure and property damage was over $100 bn. That seems like a reasonable place to start to estimate the damage from this disaster; the Kobe earthquake was not followed by a tsunami and thus did not leave the same swathe of total annihilation, but on the other hand it hit an area of Japan that was much more intensively populated and economically developed. The second way I'd estimate property losses is by noting that, in the US, households and nonfinancial businesses had roughly $45 trillion in tangible (i.e. physical) assets in 2010, or roughly $140,000 per capita. For Japan, it's probably close enough to the same number that we can use it provide a rough sense of scale. The Japanese government has stated that nearly 400,000 people have been left homeless by this disaster. Assuming that those 400,000 people have lost everything they had, and assuming that perhaps twice that number have lost at least a portion of their physical property, then this calculation suggests that the loss of private property is in the neighborhood of $70 to $100 billion. Add to that another $20 to $50 billion in destroyed infrastructure (roads, ports, railroads, airports, power grid, etc.) and we get an estimate of perhaps $100 to $150 billion in lost physical assets as a result of this disaster. to make pcb utilizing laser printer and ferric chloride. XP, Vista and windows7(Residence & Professional). The HP 1020 LaserJet is a good. signs on the in. This HP LaserJet printer is not as.